Home SharperIron Forums Principles & Consequences Fundamentalism & Evangelicalism James White responds to the EO "Answer Man"
James White responds to the EO "Answer Man"
My response to this CRI-BAM quote from an EO author. This quotation was posted on the CRI Bible Answer Man FB page today. I’d like to respond to it. Yes, actually, we do—we just define it properly, which is not done by Frederica Mathewes-Green, an Eastern Orthodox writer. What is more, I have, repeatedly, accurately defined sola scriptura while a guest on the Bible Answer Man broadcast. In any case, I believe, “literally,” that the θεόπνευστος revelation of God known as the Scriptures (the ONLY example of what we KNOW to be θεόπνευστος) is the sole infallible rule of faith for the church. I believe as Gregory of Nyssa, long ago: "..we make the Holy Scriptures the canon and the rule of every dogma; we of necessity look upon that, and receive alone that which may be made conformable to the intention of those writings." (On the Soul and Resurrection). But as we will see, Frederica Mathewes-Green, and Mr. Hanegraaff, confuses the issue. Yes, everyone believes the Bible must be responsibly interpreted—that is, when you seek to understand the intention of the original author, in the original language, original context, etc., and seek to then harmonize that with the Scriptures as a whole, you are clearly seeking to avoid turning the Bible into your own personal playground from which you can derive any meaning you wish. Yes, there are proper rules to hermeneutics and exegesis. 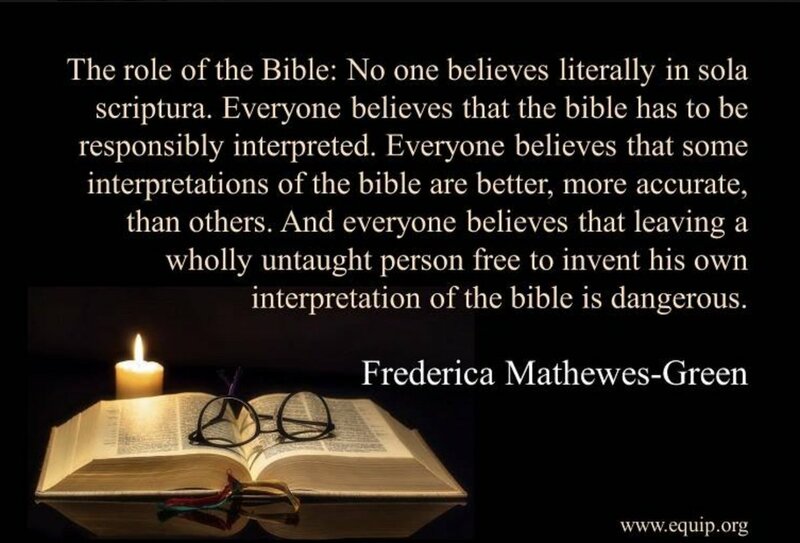 But what Frederica Mathewes-Green does not understand is that this is in no way detrimental to a strong and full belief in sola scriptura. Instead, the EO position is that rather than honoring the Word by exegeting it consistently and harmoniously with both the near and far contexts, we must avoid the danger of the Bible and place it under a higher authority, specifically, the Tradition defined by the Church. In the Orthodox context, this is the tradition as codified as it existed about seven or eight centuries after the death of Christ. Whether that Tradition itself was accurate at that time we cannot say, for the Orthodox system has no means of self-correction once it subjects that which is θεόπνευστος to that which is plainly not. Just as Rome’s claim to infallibility results in sola ecclesia, the church in monologue and hence fundamentally unreformable on the deepest level, so too the Orthodox commitment to the Tradition that has become entrenched from just over a thousand years ago leads to sola traditio, sola musterio. Neither system can fundamentally be corrected by the voice of the Shepherd, muted under the thick cloth of Tradition. 1.6. The whole counsel of God concerning all things necessary for His own glory, man’s salvation, faith and life, is either expressly set down in Scripture, or by good and necessary consequence may be deduced from Scripture: unto which nothing at any time is to be added, whether by new revelations of the Spirit, or traditions of men. Nevertheless, we acknowledge the inward illumination of the Spirit of God to be necessary for the saving understanding of such things as are revealed in the Word: and that there are some circumstances concerning the worship of God, and government of the Church, common to human actions and societies, which are to be ordered by the light of nature, and Christian prudence, according to the general rules of the Word, which are always to be observed. 1.7. All things in Scripture are not alike plain in themselves, nor alike clear unto all: yet those things which are necessary to be known, believed, and observed for salvation are so clearly propounded, and opened in some place of Scripture or other, that not only the learned, but the unlearned, in a due use of the ordinary means, may attain unto a sufficient understanding of them. The problem with Frederica Mathewes-Green’s words is that she is conflating what are necessarily distinct categories. The “unlearned and unstable” distort the Scriptures to their own destruction, this is quite true (2 Peter 3:16). But the problem here is not with the inspired Word, but with the “unlearned and unstable” interpreter. It is not the Bible that is dangerous, it is the rebel sinner who dares to handle it improperly. The answer to this problem is not to safeguard the Bible by subjecting it to a traditional coffin of fossilized ritual and belief! It is to contrast its misuse and abuse with careful, God-honoring exegesis and proclamation. It would be like someone pointing out that guns can be dangerous, therefore, we should only have paintings of guns done by a particular group of artists who can properly “interpret” the gun for us. No, the problem is with the user, not the object that is used. The answer is the proper training of the user, not the fundamental redefinition of the object being used. Further, a painted gun cannot function as the real thing. When evil men are breaking into your home, the painting will be of no benefit to you. And when the Scriptures are subjected to the stifling strictures of an aged tradition (note I do not for a moment accept the claim that it is an *apostolic* tradition), it likewise loses its usefulness.